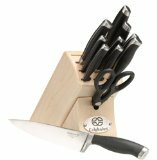 This Calphalon knife set is perfect for almost every kitchen. The knives are forged from a single piece of high carbonized steel to make a set that will stay sharp for many uses. Use them to slice and dice with the best of them as you prepare stir-fries, potato salad or slice apples for pie. The maple block looks great and fits easily on the countertop, keeping your knives away from small hands. The Calphalon knife set is made from high carbonized steel to retain a sharp edge that is easily honed when it finally dulls. A full tang extends through the handle to create well-balanced knives that are easy to use. The handles are contoured and seamless, to prevent moisture absorption, cracking or chipping. Each knife has its name etched on the end for easy identification when the knives are in the block. The block is made of solid maple. The entire set comes with a lifetime warranty. The biggest complaint about the Calphalon knife set is that the block is a bit small, making the knives crowded when they are put away. There also aren't enough slots for all the steak knives. Some people have complained of the knives rusting a bit, but with proper care, rusting should not be a problem. They are not recommended for the dishwasher, but should be hand washed and dried for the best results. This maple block and knife set have a contemporary design that looks good in any kitchen. The 15 piece set includes a 4 ½ inch paring knife, a 6 inch utility knife, an 8 inch slicing knife, an 8 inch bread knife, an 8 inch chef's knife, a 6 inch meat fork and a 10 inch sharpening steel. This set includes a pair of kitchen shears and 6 steak knives as a bonus. Horizontal slots in the maple block save wear and tear on the knife blades. A lifetime warranty covers this knife set. All in all, this set offers great value for the money. You get a high quality set of knives that keep their edge for a long time. They are easy to sharpen using the steel that comes as part of the set. If all you've used are cheap knives, you will be delighted at how nice sharp knives are in the kitchen. With proper care, this set will last a lifetime, helping to make your time in the kitchen a delight.